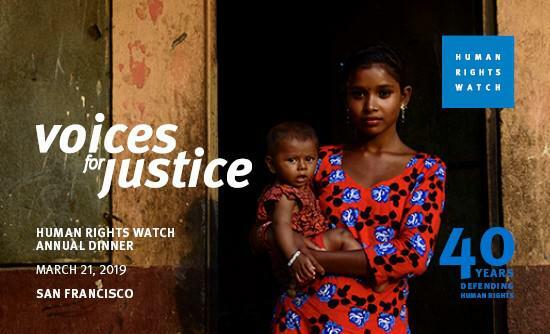 Join us at our Voices for Justice Human Rights Watch Annual Dinner in San Francisco March 21, 2019. We invite you to join us on Thursday, June 28th at 9:15 am at our office (or by phone) for “Journey to Raqqa: Human Rights Watch Investigates Life after ISIS” -- a discussion with our Acting Director for Emergencies Priyanka Motaparthy. The discussion will focus on Priyanka's recent trip to Northern Syria, where she visited displaced persons’ camps, former ISIS detention centers, and mass graves. This research is the basis of an upcoming report documenting the stories of those detained and disappeared by ISIS, and their families’ quest to learn what happened to them after ISIS was driven from the area. How far have we come since the groundbreaking Convention on the Rights of Persons with Disabilities? We hope you'll join us for a conversation with Kriti Sharma on Wednesday, June 6th, 2018 at 12 pm at the HRW SF office to learn more about the work of the Disability Rights Division and the progress of disability rights worldwide. Please RSVP to craigmi@hrw.org. On Wednesday, April 11th at 7 pm at Dolby Cinema, Human Rights Watch, in partnership with the San Francisco International Film Festival and co-hosts Natasha and David Dolby, will host a screening of The Rescue List, a documentary charting the courageous efforts of a local safe house to rescue children enslaved to fishermen on Ghana's Lake Volta. Through a character-driven approach and a riveting vérité style, The Rescue List charts the unfolding drama of rescue operations alongside a moving portrait of the boys’ recoveries. By doing so, the film tells a cinematic story of friendship and courage—a story that transcends the trope of victimhood and truly illustrates what it means to love and to survive. This event will feature a post-film Q&A with the filmmakers, Zachary Fink and Alyssa Fedele; Brad Adams, Asia Director at Human Rights Watch; and Professor Cathy Zimmerman, a behavioral and social scientist who lectures on migration and health, human trafficking, and gender-based violence. Join us at 9 am on Wednesday, March 21 for a conversation with Marcos Orellana, Director of the Environment and Human Rights Division. Join us for the opening of Richard Misrach: The Writing on the Wall at the Fraenkel Gallery on July 13, 5:30-7:30PM. For four decades Richard Misrach has been one of the most significant and influential photographers of the American landscape. This collection includes recent photographs made in response to the 2016 US presidential election. We are thrilled that 50% of all proceeds from the exhibition will be donated to Human Rights Watch. Misrach’s recent photographs are a direct response to the highly charged political climate and accompanying rhetoric of hostility felt across America today. In his travels through desolate areas of southern California, Arizona, and Nevada, the artist found countless signs of despair, protest, and anger scrawled on derelict buildings and rocky outcrops. His images of spray-painted graffiti record messages of desperation, hatred, grief, and hopelessness for the country’s future. The new work builds on Misrach’s photographs of related inscriptions made during the Obama years, images that now can be seen as unwitting omens of the abrupt shift in public discourse that was to come. We are grateful to the Fraenkel Gallery and Richard Misrach for their partnership. We hope to see you there! San Francisco International Film Festival - Thank You! On April 13, the San Francisco Committee took part in a moving and thought-provoking evening centered around City of Ghosts, a documentary featuring citizen journalists in Syria who risk their lives to document human rights atrocities. Following the film screening, audience members took part in an interactive panel and Q&A. Panelists included the Executive Director of HRW's Middle East and North Africa Division Sarah Leah Whitson, acclaimed director Matthew Heineman, and the Executive Director of the San Francisco Film Society, Noah Cowan. We thank all those who were involved in the planning of the event and our wonderful audience for making the film screening a success! On Thursday, April 13 at 6:00 p.m., the San Francisco Film Society, as part of the 60th SF International Film Festival, will host a screening of award-winning documentary filmmaker Matthew Heineman's "City of Ghosts" at the Alamo Drafthouse Cinema - New Mission. Director Matthew Heineman is expected to be in attendance, as well as Sarah Leah Whitson, executive director of HRW's Middle East and North Africa Division -- we highly encourage those with an interest in human rights, journalism, or the Syrian conflict to attend! Matthew Heineman’s powerful documentary follows the men behind Raqqa is Being Slaughtered Silently—a group of activists who have risked their personal freedom and safety to confront the Islamic Brotherhood by sharing information. In our current political climate, the mission of this film’s subjects becomes more urgent than ever, as these men fight to share the truth for their family, their country, and the greater good. SF Committee at the 2017 New York Voices for Justice Dinner! Last Wednesday, at the 2017 Voices for Justice Dinner in New York City, businessman and philanthropist George Soros, alongside Yonous Muhammadi, was honored for his extraordinary commitment toward promoting human rights and justice around the world with the Alison Des Forges Award for Extraordinary Activism. The Voices for Justice Annual Dinners gather together over 6,800 influential supporters worldwide every year, and honor courageous individuals who protect and defend human rights across the globe. SF Committee members Joy Alferness, Tina Bou-Saba, Natasha Dolby, Marty Krasney, and Danielle Kraaijvanger joined us for the event. On March 1st, Human Rights Watch, in partnership with #cut50, Healing Dialogue and Action, and hundreds of Ambassadors of Empathy all across the country took part in the national Day of Empathy, one of the single largest days of action in criminal justice history! Below is a message from Joy Alferness, Chair of the San Francisco Committee, on the work we accomplished during the Day of Empathy. It has been a little more than a week since I returned from attending the Day of Empathy in Sacramento, and I want to share some thoughts and reflections on this wonderful experience with you. The Day of Empathy was a day devoted to meeting with California legislators to voice support for three bills that promote criminal justice reform. It was put together by Cut50, Healing Dialogue and Action, and our very own Human Rights Watch. While the primary purpose of our gathering was to march to the Capitol and lend our voices in support of criminal justice reform, I was fortunate enough to participate in a retreat the day before these legislator visits. This retreat brought together an incredible group of people, including former prisoners, families of prisoners, victims’ family members and former victims, as well as allies and advocates. I heard incredible stories of unimaginable pain but also witnessed the power of forgiveness and the real results of restorative justice programs. These two days were led, in part, by our very own Elizabeth Calvin, who is a Children’s Rights researcher for HRW, and a personal hero of mine. She has devoted her career to ending unfair sentences for juveniles and has worked tirelessly and selflessly on these issues. It was beautiful to witness how everyone responded to her during the 48 hours that we were together. There are many, many people whose lives have been affected by mass incarceration who see Elizabeth, and HRW, as their champions. Elizabeth is not only an incredibly strong member of the HRW team, but she is a mighty advocate for the people whose rights she is fighting for every day. On Wednesday, we all marched in solidarity to the California State Capitol. Approximately one hundred of us, in teams, visited 105 state legislators’ offices in less than a day to voice our support for SB 394 (ending life without parole sentences for juveniles -- a practice only allowed in the U.S.), SB 395 (which would ensure a responsible adult is available for counsel when someone under the age of 18 is being questioned by police), and AB 1384 (which would create program standards for trauma recovery centers that serve victims and their families). It was an immensely powerful day, and I was so proud of what we were able to do together. You will find below some opportunities to use your voices in support of two of these bills: SB 394 and SB 395. Our advocacy is an important tool we can use to move the needle on these ongoing injustices faced by juveniles in our country’s prison system. I hope you will join me in amplifying the incredible work being done by Elizabeth and others. I am filled with gratitude that these two days gave me the opportunity to gain a window into the human proof of HRW’s meaningful advocacy. There was more than one occasion over the course of my two days there that someone shared with me how the efforts of HRW had impacted their lives, personally. More than anything, I felt enormous pride to be a part of the HRW Council, and I hope you all do as well. Your support has truly changed lives for the better, and I offer you all my deepest thanks for all that you do to further this important work. Last night, we were fortunate to host a dinner with LGBT Program Researcher Kyle Knight, who spoke candidly about his work with Japanese youth facing discrimination, societal pressure, and even linguistic barriers. It was an insightful and powerful discussion, and a reminder of why research is so vital to our cause. Thank you to San Francisco Committee member Mark Grace for graciously hosting—and we hope to see everyone at a future HRW event!